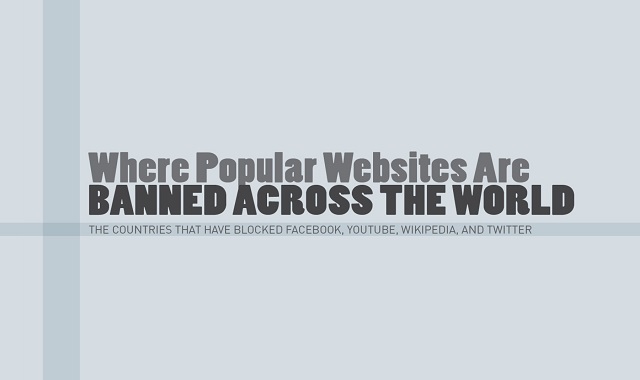 Where Popular Websites Are BANNED Across The World #infographic ~ Visualistan '+g+"
Which countries have blocked Facebook, Twitter, YouTube, and Wikipedia — websites that are vital for our day-to-day communication and information-sharing? Many people may know about the extreme situation in North Korea and the widespread censorship in China but internet censorship around the world is far more widespread than many realize. Countries like Germany, the UK, and Brazil have also banned or threatened to ban major websites like these. On the list of countries that banned YouTube at one point is Turkey and Armenia, with many more countries, like Russia, either threatening a ban or interfering with specific content. This doesn’t even touch on the potential that websites like Twitter, Wikipedia, YouTube, and Facebook often censor content themselves! This data visualization infographic will shed some light on where these major websites are inaccessible or have been censored in one way or another over the years and reveal what percentage of countries around the world are Internet users.